The number of Britons living in poverty has more than doubled over the past 30 years, a report has revealed. About one in three UK families now live below the breadline, despite the British economy doubling in size over the same period. The UK’s largest ever study into poverty in the country has urged the government to take measures to tackle growing levels of poverty. The Poverty and Social Exclusion in the United Kingdom (PSE) project, led by the University of Bristol, has revealed the wealth gap between the haves and the have-nots in the UK is widening still further. Almost 18 million people are unable to afford adequate housing, while one in three do not have the money to heat their homes in winter. Perhaps the most interesting revelation unearthed by the report is the fact that most of the people living in poverty are employed, dispelling the myth propagated by ministers that poverty is a consequence of lack of work, the PSE report says. It found that the majority of children living below the breadline live in small families with at least one employed parent. In households that suffer from food deprivation, the study found that parents often sacrifice their own wellbeing for that of their children. In 93 percent of cases at least one parent skimped on meals “often”to make sure others had enough to eat. According to the study, women were more likely to make sacrifices, cutting back on clothes and social visits. “The research has shown that in many households’ parents sacrifice their own welfare – going without adequate food, clothing or a social life – in order to try to protect their children from poverty and deprivation,” Professor Jonathan Bradshaw, of the University of York, said in the PSE’s statement. 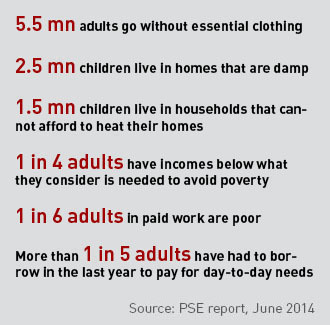 The report calls on the government to address the growing number of poor in the UK. Due to Uk electoral system we have given ideologues from Thatcher onwards an “elective dictatorship”. The current motley crew are ideologues par excellence (e.g see Michael Gove / pseudo charity Atlantic Bridge !) aided and abetted by Liberal Democrats who were formerly a left wing alternative to our Labour Party (see Orange Book Lib Dems) !? Not too much of a rant I hope?